Contents and Media: See description and images below. Advantages: Sturdy construction; simple idea; very useful addition to any modeller's bench. Conclusion: There are other photo-etch CA applicators on the market, but as far as I’m aware, this is the only one that incorporates a base with racks to hold the applicators, and also platforms onto which you will drip the superglue. A superbly made tool that isn’t too cumbersome for sitting in and amongst your ongoing project work. .
DSPIAE seems to be quite prolific at the moment and have a solution for just about every one of our modelling needs. Today, they turn their attention to the humble application of superglue (CA) during the course of our modelling exploits. 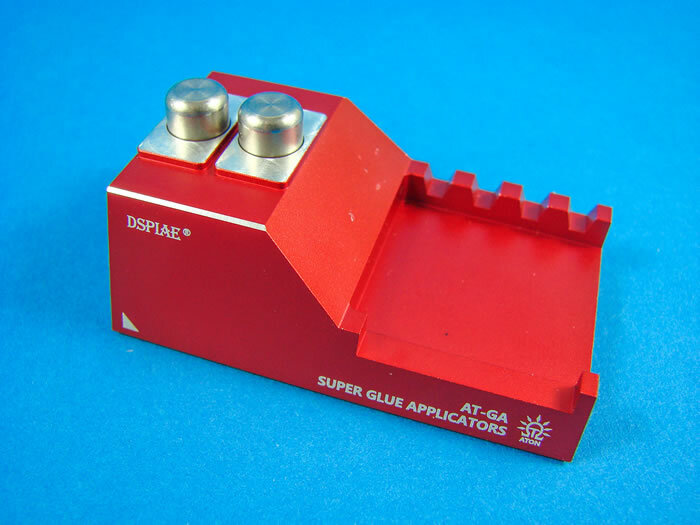 As is standard with products from this Chinese company, the Superglue Auxiliary Applicator is packaged into a robust but small box with the usual Aztec-style imagery and from the outset is apparent that you are dealing with a high-quality product. Of course, this is confirmed by our previous reviews of DSPIAE products, such as the Circle Cutter, Single Blade Nipper, Craft Tool Rack and Hand Drill etc. 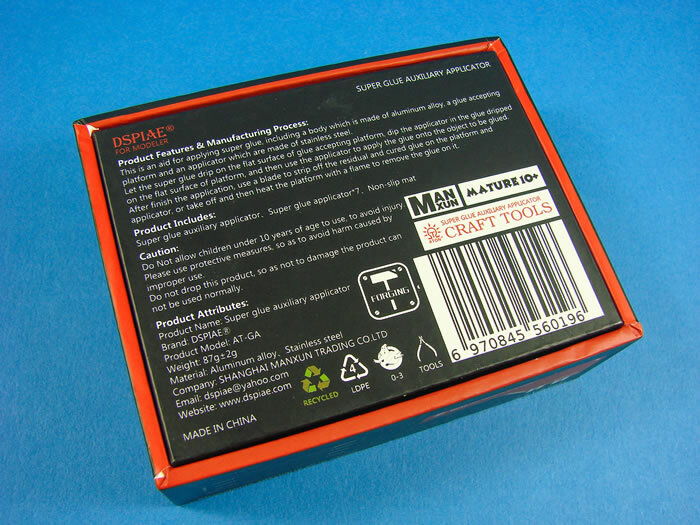 Flipping the box over, some general product details are supplied in print, plus a synopsis of the tool itself, although this can be worked out pretty quickly once you have your hands on the supplied components. 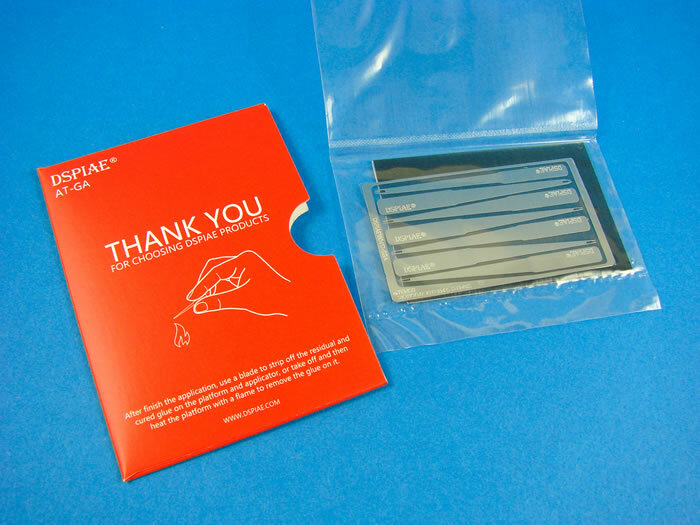 Lifting the lid reveals a cardboard envelope with the usual ‘Thank You’ message on the front, plus a tip for using the cleaning the business-end of the glue applicator. More on that soon. Inside the envelope is a stainless-steel photo-etch fret containing seven CA applicators, with varying size reservoirs. You will of course need to remove these from the fret using whatever means you normally do for PE parts. Inside the box, we find the base of the applicator, machined from aluminium alloy, and then anodised in the now familiar shade of red that we see with DSPIAE tools. The main block has two circular indents in the raised portion, and the lower area forms a rack for storing the CA applicators that you removed from the PE fret. A small clear zip-lock wallet contains what I originally mistook for two magnets, but are in fact stainless steel platforms onto which you’ll apply the CA. These are curved on the top edge, and you need to insert the squared edges into the indents on the main block. A self-adhesive rubber base is included, and you must peel this back and apply it to the underside of the main block. That’s it, we’re ready to roll! With the CA dripped onto the platform(s), your applicator of choice is then used to touch the edge of the superglue pool, filling up the small reservoir. You will then transfer this to your project work, with the CA running from the applicator via capillary action. 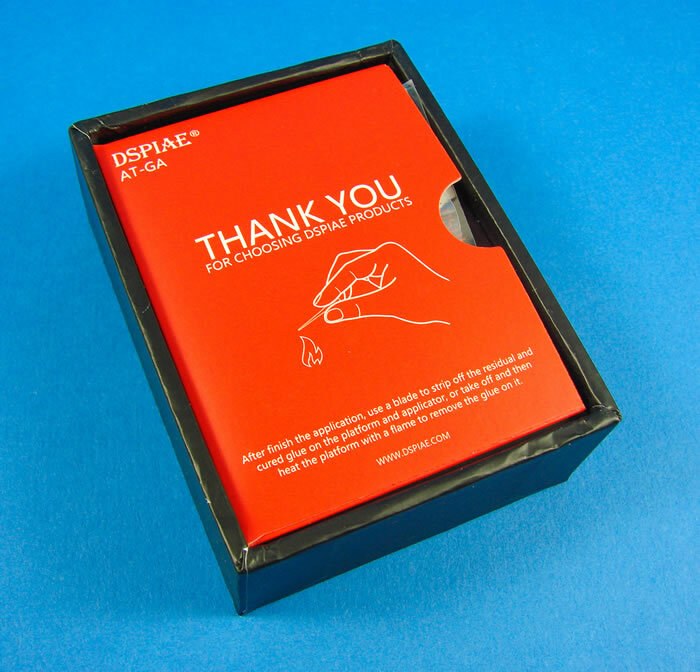 You can use the racks to store the applicators, and when finished, DSPIAE suggest holding the tip of the applicator in a flame, to burn away any remnants of glue and leave it clean for your next use. A nice and simple tool that will perform exactly as you expect. 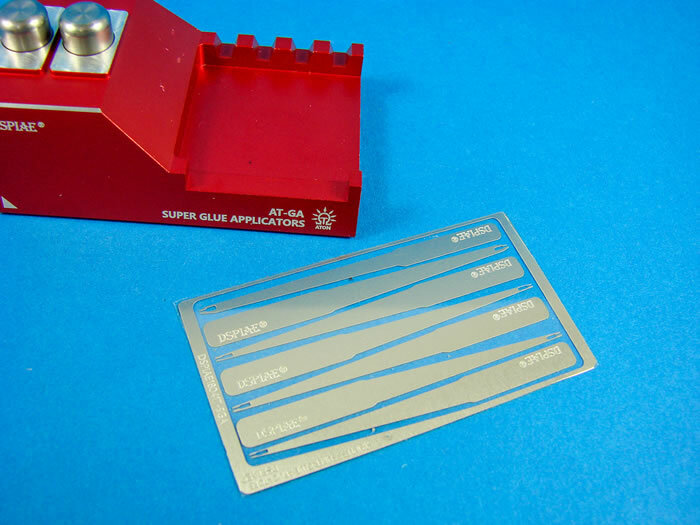 There are other photo-etch CA applicators on the market, but as far as I’m aware, this is the only one that incorporates a base with racks to hold the applicators, and also platforms onto which you will drip the superglue. A superbly made tool that isn’t too cumbersome for sitting in and amongst your ongoing project work.